Fire Marshals have brought in excavation equipment to search the rubble of the home on Hemlock Street. 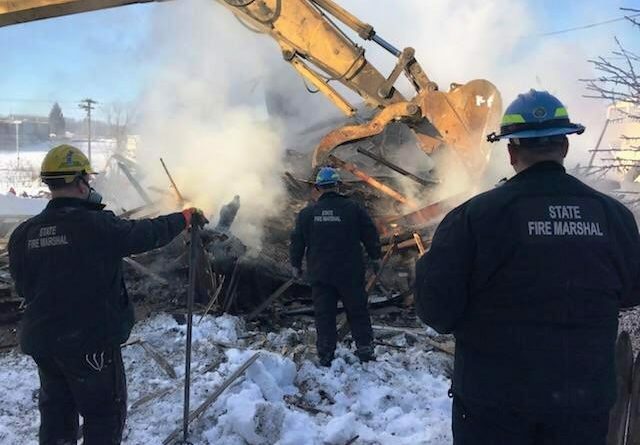 A body was found Thursday in a Millinocket house that had burned to the ground earlier in the morning, according to the state fire marshal’s office. The man’s body was found in what was left of the first floor of a 2½-story house on Hemlock Street. 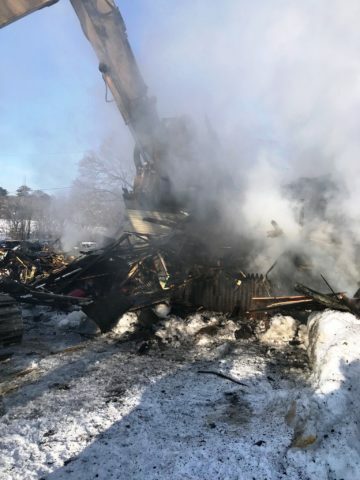 The home was engulfed in flames when firefighters were called at about 3:30 a.m. Dec. 20, according to Stephen McCausland, spokesman for the Maine Department of Public Safety. The remains of a 2 ½ story house in Millinocket that burned to the ground early Thursday morning. Fire Marshals brought in excavation equipment to search the rubble of the home on Hemlock Street. One man was unaccounted for Thursday morning after the house fire, according to the state fire marshal’s office. It is unclear if that individual’s remains were those found at the scene. The body is being taken Augusta to be examined by the state medical examiner’s office. The examination likely will take place Friday. The investigation into the cause of the fire is continuing.